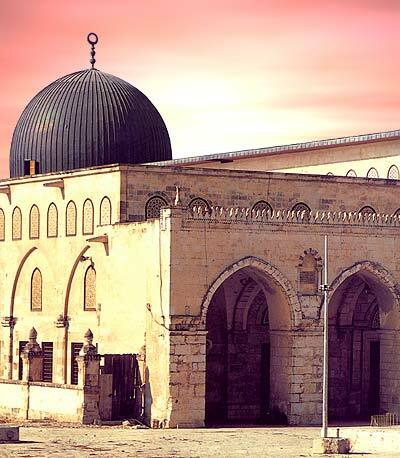 Heads of the Islamic movement inside the Green Line in Jerusalem and the supreme Islamic association and ministry of Religious Affairs have revealed that Israel is constructing a secret synagogue for the purpose of Jewish rituals beneath Al-Aqsa mosque in Jerusalem. "The Israeli authorities have been exploiting the big gates of the western side of al-Aqsa since 1996 through conducting a series of excavation works which ended with clandestinely erecting a synagogue," Sheikh Ikrema Sabri explained. He claims this construction threatens the structural integrity of the mosque, is built on a sacred muslim graveyard as part of the recently opened Museum of Tolerance, and is an attempt to bolster public opinion about the presence of a temple there which muslims believe have no factual existence. and, dear anonymous, how can you be so sure? i'd like to read more about this if you have any thing to throw my way. I just discovered your blog and it seemed interesting at first -- I added it to my blog reader -- but your willingness to believe anything diminishes the credibility you started with. For example, where are the photos of this supposed excavation? It seems like you'll believe whatever fits into your world view of conspiracy. i have neither believed nor accepted anything, but have merely re-publicized a claim already put forth, and have urged readers to supply me with more info either way. and get over yourself already - who isn't subject to the architectures of their own conspiracy making? Posting the story as you did, as if it was fact, makes you look naive and gullible, at best. Your response proves it. well, i could really care less whether I have your support or readership, so onwards with you. and as I expected, you would not be able to offer any resources yourself confirming or disputing this. see ya dear anonymous reader! • You know that it is virtually impossible to prove a negative; the burden to prove it must be on the one makes a claim. • As well, go Google. There is NOTHING but the initial story which in your conclusive term "revealed" that the Israelis were up to no good. So much for your having a clear mind. Btw, your language belies you. The word you used in the post -- "revealed -- is the sort of word used when there is nothing to debate. So your claim that you "neither believed nor accepted anything" is absurd unless you are ignorant of language, which you are clearly not. i will easily admit that perhaps i could have reframed or presented the story in a more objective light, but your willingness to dismiss the claim immediately without any other information i would say is just as ridiculous as my apparent accepting that the claim is true. before writing it off to proposterous conspiracy theory might you approach this with the same degree of open mindedness and objectivity that you demand of me? i guess i don't see your reaction as much different than mine, only just pretending that it is. i say - we (neither of us) don't know squat about the truthfullness or lack of truthfulness about this claim. we have no other info to go on and therefore it could be utterly false, or utterly otherwise. i don't have enough info. but, i ask you - might you consider the possibility that there may be some credibility to the claim before knee-jerk responses of dismissing it altogether? Why do you assume that mine is a knee-jerk response? I didn't dismiss the claim until I looked further. After reading your post I immediately went to Google to see if I could find more about what would be a huge story and there was nothing there except for the original gambit from a party -- the Moslem cleric if I remember correctly -- who can on the face hardly be seen as a fair-handed witness. His story itself had no pictures..no documentation of any kind. It was a mere claim which you accepted at face-value. Please apply your critical mind even to stories which you would like to believe. i guess your own assumptions in all of this bothered me. and how you proceeded to attack me without first opening up a conversation about this story. in your first comment alone, you told me how you found the blog interesting, but (seemingly) based on this one post alone (or so you implied) you have written the entire thing off to lack of credibility and conspiracy theory. not the most diplomatic approach to engaging a constructively critical conversation, to say the least. while claiming i fit my critique according to my own willingness to believe anything i read, you failed to mention in that first comment how you had properly examined the situation and come to a conclusion based on a lack of other evidence. Had you mentioned this i think your own credibility would have suffered less after merely taking your little shot at me. then you said this: Please apply your critical mind even to stories which you would like to believe. assuming of course that i must want to believe the story is true. while your original point is well taken and i have acknowledged it already (despite your piss poor ability to respectfully bring it to my attention), your full of your own presumptuousness, disrespect, and this dialog is now officially boring me. so let's end it here.